As mentioned in my last newsletter, playing Blokus with my extended family was a lot of fun, especially when I was also taking photos of my cute grandchildren. James and our son enjoyed the game so much that they played two more games by themselves. The next day, while our son and his family were out visiting friends, James invited me to play a game with him. 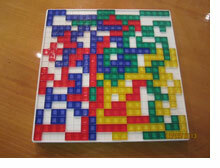 "Sure," I jokingly said, "there is no way I won't win Blokus. You know I was very good with Tetris!" Like all couples, we have our differences. I am quick and intuitive. James is analytical and deliberate. All was well when we started. However, after he repeatedly blocked my planned steps a few times, I started to get irritated. "Why are you taking so long?" The more I rushed him, the deeper he thought; the more deliberate he became, the more I lost my temper. When my competitiveness was aroused, I got angry that James could see five steps ahead. At one point of the game, I was so frustrated that I was in tears. Like a little kid, I yelled, "I don't want to play with you anymore!" Do you get the picture? Relationships are not a game. It is not about who wins. The same is true about many things in life. Do you wish for better relationships, better jobs, better health, more money, whatever? Instead of focusing on the techniques and skills of what to do and what not to do, you might need to pay attention to your mindset. May you find some inspiration and tips here. In your family, do you play for fun or to win? When you have disagreement, do you argue about what is right or wrong, and who is right? Or do you focus on bonding by sharing your feelings, thoughts and needs so that each of you feel understood and accepted? Although your definition of success might be different from mine, lasting successes may not come easily. Rollo The Clown: [singing] "If you will just believe it's true/ Then there is nothing you can't do/ There's not a mountain that you can't climb/ There's not a river you can't make it over/ There's no tomorrow that you can't find if you try." Tillie The Little Engine That Could: "I think I can, I think I can, I think I can, I think I can!" As even children's characters will attest, a winning mindset is a trait to adopt. It attracts happiness, health, fulfilment and success. But what is a mindset, really? A mindset is a person's established set of attitudes that are based on their assumptions. These assumptions predetermine a person's reactions to and interpretations of any event, environment or situation. Whether positive or negative, a person's mindset is engrained, habitual and affects all aspects of his or her professional and personal life. Is Your Mindset Working to Your Advantage or Holding You Back? When facing a new challenge, do you react with confidence, knowing that with time, effort and practice you can succeed? Or do you find yourself questioning your abilities, talent and motivation? Do you view failure as simply part of the process? Or do you avoid challenges in order to preserve your pride? When you encounter setbacks and criticism, do you recalibrate and persevere or simply give up to save face? How a person interprets and answers those questions gives insight into what type of mindset he or she has. In her book Mindset, Stanford University psychologist Carol Dweck identifies two general mindsets: fixed and growth. It's easy to tell someone to develop a growth mindset, but, if mindset is so deeply engrained, how does a person change it? For Christians, the Apostle Paul urges us to renew our minds (Romans 12:2). It is wonderful that God, through the Holy Spirit, has given us the mind of Christ in our new spirit. However, we still have to learn to adapt to His mindset - "In your relationships with one another, have the same mindset as Christ Jesus" (Philippians 2:5). Want to change? Here are six ways to begin. 1. Embrace failure instead of avoiding it. The faster the failure, the quicker the learning. Before starting his auto manufacturing company, Henry Ford failed at his first several businesses. What would the industrial landscape look like had he given up after his first try? Remember, embracing failure also means success can arrive that much sooner. 2. Think abundance instead of scarcity. When it comes to spending money on self-improvement, many people resist due to cost. But clients and customers are attracted to people who believe in and value themselves. Instead of thinking of personal growth as an expense, think of it as an investment in your future. 3. Embrace challenges. People who have a mindset of "growth" realize that challenges are just opportunities in disguise, and they choose to actively seek them out. 4. Use setbacks as learning opportunities. No matter how thorough the plan, no matter how well-executed the details, obstacles will surface. Besides, who can predict with any real accuracy what setbacks will occur? Instead of wasting energy trying to prevent the unknown, why not just face obstacles as they show up? 5. Don't take it personally. Sometimes the best opportunities for personal and professional growth come from leveraging harsh criticism and negative feedback. How well do you listen to your customers' and clients' complaints? 6. Stop re-inventing the wheel. Instead of resenting successful people for what they have accomplished, look to them to learn how they did it and turn that to your advantage. Incorporating these simple, strategic shifts in mindset provides opportunities to experience not only tangible results (i.e., the bottom line), they also go a long way to shoring up determination, building self-confidence and encouraging action, productivity and fulfillment.